One month ago, Joe Torre told managers to stop arguing balls and strikes with the help of video evidence to support their case, and the stats confirm, Torre's warning worked...Kind of...Maybe...Not really. Fewer managers are getting tossed for pitches. Since Monday July 18 and the first series since MLB's Chief Baseball Officer distributed his managerial memo, just two managers have been ejected for arguing balls and strikes. They would be Boston's John Farrell, who was ejected by Gabe Morales on July 31 in Boston, and Milwaukee's Craig Counsell, who got the boot courtesy of Bill Miller on August 12. In both cases, the umpire's call was correct and the ejected skipper was wrong. In comparing these two ejections over the course of 394 games and one month to the 25 managerial ball/strike ejections over 1,344 games prior to Torre's directive, we find that the rate of ejection prior to Torre's edict was one managerial ball/strike ejection per 53.76 games, compared to one such ejection per 197 games since, which is approximately a 72% drop in these types of ejection. Gibbons has stopped getting himself run. For example, Blue Jays Manager John Gibbons, who led baseball with six ejections from Opening Day through July 1, suddenly stopped getting ejected altogether: he has zero ejections since. So Torre's warning worked, right? The answer is "yes," if the only consideration is whether a manager has been ejected for arguing balls and strikes. Otherwise, it's not that simple. Since Torre's memo, more assistant coaches (bench, base, hitting, and pitching coaches, etc.) have received pitch call ejections while their respective skippers have stayed in the ballgame. 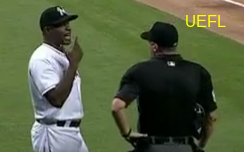 Coaches like Barry Bonds are getting ejected. Over the same 394 game period beginning July 18, six coaches—including one assistant of an assistant—have been ejected exclusively for arguing balls and strikes: that's one ejection for every 65.67 games played. Combining all manager and coach ejections for arguing balls and strikes over that period, we see that managers/coaches have been tossed on the order of once every 49.25 games played, which is similar to the previous period's rate of 53.76 games per managerial ball/strike ejection. Non-managerial coach ejections historically have occurred less frequently than those of managers and players: for example, just 12 coaches were ejected prior to July 18 (one per 112 games), compared to 53 players and 47 managers for that same period, meaning that coaches comprised 11% of all ejections over that time. Since then, however, coaches have made up a greater share of overall ejections, essentially doubling their ejection representation rate (six coaches / 29 ejections = 21% of ejections are coaches). 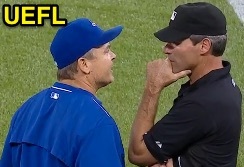 Conclusion: As was the case when baseball first introduced expanded Replay Review in 2014, ejections did not decrease as the result of MLB's attempt to ease the team-umpire relationship through a new initiative (whether via instant replay in 2014 or Torre's bulletin in July 2016); in contrast, ejections actually increased (in 2014), but more notably, the reason for ejection shifted drastically in 2014 (and 2015). Instead of getting ejected for arguing a simple out vs. safe call at first base, team personnel switched to more vehement ball/strike arguments, which effectively kept their ejection numbers at levels comparable to, and in no way less than, the previous season's. 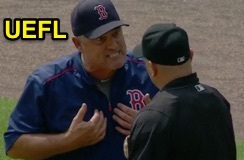 Farrell argues 3B Coach Butterfield's ejection. Now that baseball and Torre are trying to crack down on this ejection reason shift by telling managers to stop getting ejected under certain circumstances, teams are evolving once again: Managers are dutifully pulling back and taking a seat...while their coaches and assistants take ejections on their behalf, so as to preserve the baseball tradition that is arguing with and getting ejected by the umpire. 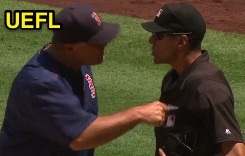 In fact (see picture of John Farrell to the right), some coaches and assistants potentially are getting ejected so as to provide their manager with an excuse to argue with the umpire, without subjecting the skipper to an ejection, akin to the queen's sacrifice in chess, which is exactly what baseball arguments have become: a chess match. So, has Torre's message worked? It depends on how literal you want to be.